Welcome to 4846 Turtle Cove Villas. New to our rental program, this second floor vacation rental on Kiawah Island is renovated and perfect for any small group of travelers. Centrally located on Kiawah Island, this villa offers the perfect location for guests to enjoy a short walk to the beach, close proximity to the Sanctuary and Night Heron Park, and only a short drive from some great restaurants and other amenities that the surrounding areas have to offer! Enter the villa and immediately appreciate the updated design with an open floorplan and spacious rooms. The living room has a simple and elegant design with modern furnishings and white accents that compliment the light coming in from the porch windows. It is perfect for relaxing and enjoying a good book, or watching the flat-screen TV with a Blu-ray DVD player. There is also a wet-bar to enjoy an evening cocktail. 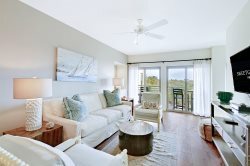 Located just off of the living room through the sliding doors, the screened in porch allows the guest to take in the beautiful sights and sounds that the island has to offer. Sit back and enjoy the lagoon views. You'll be sure to spot an alligator or two. The dining area, which allows for comfortable seating for four, is only steps away from the open kitchen area where access is available from both the dining area and the front hallway leading to the living room. With granite countertops and updated appliances, this kitchen is great to whip up a delicious meal. Head into the master bedroom, which offers a king bed, flat-screen TV, private access to the screened-in back porch, and an ensuite bathroom. The second bedroom contains a queen bed with a flat-screen TV, a small sitting area next to the windows overlooking the view, and a semi-private bathroom that also accesses the hall. A memorable vacation is right at your fingertips! Kiawah Island is the perfect spot to spend a beach vacation. And what better way to spend it than here, at 4846 Turtle Cove! Call us and book it today!